Could this be a game changer for low income residents in high cost Silicon Valley? SAN JOSE, Calif. – According to the U.S. Census Bureau, the percentage of adults in the Silicon Valley who do not hold a high school diploma is well into the double digits in some communities, prompting the South Bay Consortium for Adult Education (SBCAE) to launch Open Doors, a regional campaign that brings to the forefront the diverse adult education programs that put adults lacking language, literacy or technical skills on a solid path to work, school and/or career training. Census data show that in 2016, 8.2 percent of individuals with less than a high school diploma or equivalency were unemployed, compared to 5.5 percent of individuals with some college or an associate degree and 3.6 percent of individuals with a bachelor’s degree or higher. Likewise, the poverty rate for individuals without a high school diploma is 26 percent – 10.3 percent higher than for those with a high school diploma and 15 percent higher than for those with some college or an associate degree. Within the area served by SBCAE, a partnership of five adult schools and four community colleges in Santa Clara County, the percentage of adults without a high school diploma is as high as 17.7 percent in San Jose, the consortium’s largest city, followed by 14.2 percent in Milpitas, 13.5 percent in Santa Clara and 12.9 percent in Morgan Hill, according to the census data. Statewide, 18 percent of the population aged 25 and older does not have a high school diploma or equivalency, according to census data. SBCAE member organizations offer English-language classes, apprenticeship opportunities, career education courses, basic math and literacy classes and support services for adults with disabilities, with many of these programs being free. The consortium has nine dedicated transition specialists, representing each school and college, who help students identify their educational and career goals and develop a concrete path to achieving them, laying out which classes need to be taken and in what sequence. Adults age 18 and older are eligible to enroll in classes. The Open Doors campaign seeks to highlight the region’s adult education offerings while sending the message there are many “doors” through which a would-be learner can enter. 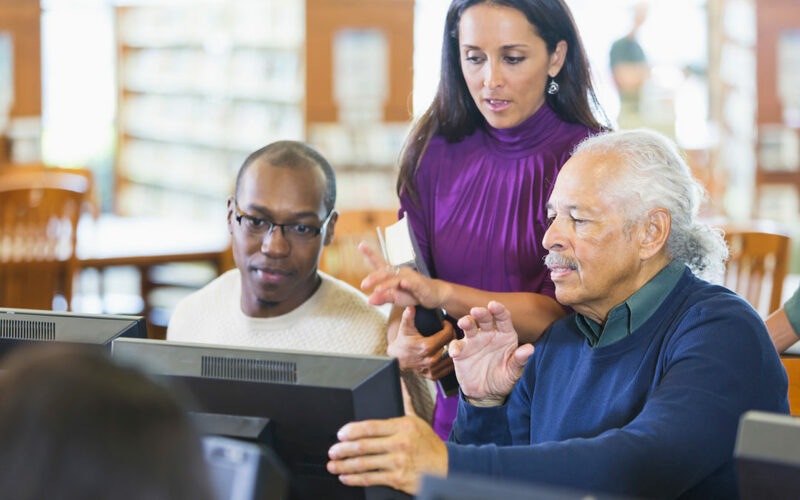 Those interested in adult education can get a quick start by visiting the campaign website to explore options and complete a short form so a transition specialist may contact them. The website also includes a map that shows the location and contact information for each transition specialist. More information about adult education programs and the SBCAE may be found at www.OpenDoorsSouthBay.org or call 408-918-5100. SBCAE organizations that are members of the Open Doors campaign include: Campbell Adult and Community Education (Campbell Unified School District); East Side Adult Education (East Side Union High School District); Santa Clara Adult Education (Santa Clara Unified School District); Milpitas Adult Education (Milpitas Unified School District); Silicon Valley Adult Education (MetroED), as well as Evergreen College and San Jose City College in the San Jose- Evergreen Community College District and Mission College and West Valley College in the West Valley-Mission Community College District.